Arrange cookies on a tray or the bottom of a container. Cover with Yoplait® Go-GURT® and set another cookie on the top to form a yogurt-and-cookie sandwich. Freeze for approximately 2 hours, or until the yogurt is frozen. Remove the yogurt sandwiches from the freezer and serve immediately. Personalize these sandwiches using your favorite flavors of Yoplait® Go-GURT® and different kinds of cookies. This last weekend some unexpected visitors came over, and it was such a nice surprise to see friends we haven’t connected with for some time. I quickly invented a little something for dinner, but completely forgot about dessert. The only thing I had on hand were some cookies and a few tubes of my kid’s Yoplait® Go-GURT®. 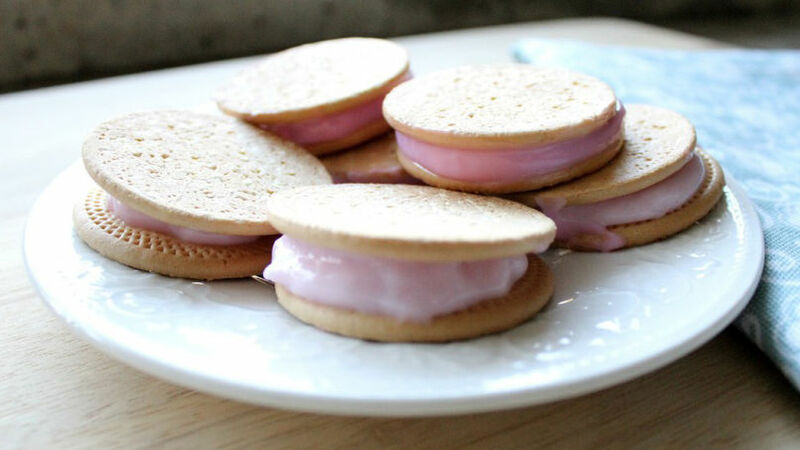 That’s when it occurred to me to prepare these delicious frozen yogurt sandwiches. With just two ingredients, my friends and family enjoyed a delicious and refreshing dessert.